On one side, the magnificent Rivière des Mille Îles flows gently along. On the other, the fairways and greens of the prestigious Laval-sur-le-Lac golf club beckon. 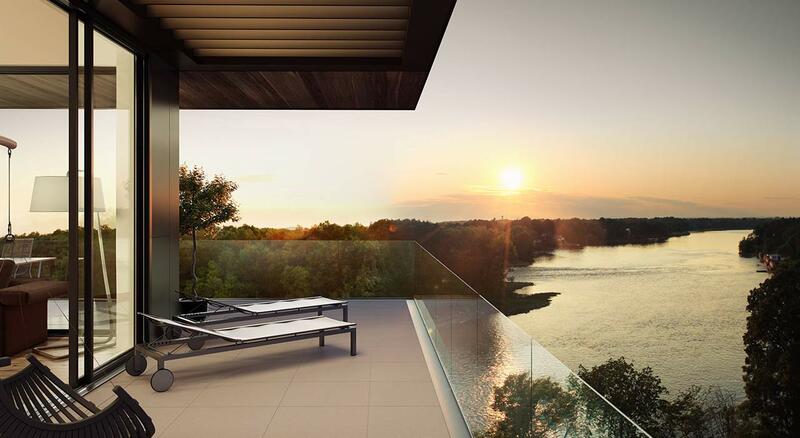 The breathtaking natural surroundings here were the original inspiration for the luxury L | L Laval-sur-le-Lac condominium project – the first to break ground in this stunning enclave in Greater Montreal. Architect Joanne Godin, of the international firm Lemay+DAA, was inspired by the area’s natural beauty to create this modern take on the English country estate, accessed by a grand central gate. Godin envisioned four streamlined pavilions, housing 24 to 30 high-end apartments of up to 4,000 square feet each, all in perfect harmony with the natural surroundings. “The architecture is all about enjoying the landscape, with floor-to-ceiling windows that look out onto the golf course and, on the other side, the river. The units have cantilevered terraces– they’re really like outdoor living rooms,” she says. Another distinguishing feature is that each condominium at L | L Laval-sur-le-Lac is like a private residence. “Every unit has a large vestibule. It’s a bit like entering an anteroom,” says designer Alain Desgagné. And then there are the rooms themselves, which are bright and high-ceilinged – perfectly tailored to make the most of the surrounding nature. L | L Laval-sur-le-Lac was conceived as a luxurious private club, with a heated indoor infinity pool, tennis courts and a lounge equipped with a cellar that lets fellow residents mingle over a glass of wine. “It’s all built on a human scale, with a real touch of sophistication,” says Desgagné. In short, a jewel in a natural setting. Visit the L | L Laval-sur-le-Lac sales pavilion today and explore our 1,700-square-foot show unit created by designer Alain Desgagné.